A few weeks ago I attended an all day workshop with my blogger friend Julien. The Gathering Project (more on that and recap coming next week) is an all day event geared toward the creative entertainer. We learned things from painting our own dinnerware, to whipping up the perfect summer dessert, and making focaccia bread. 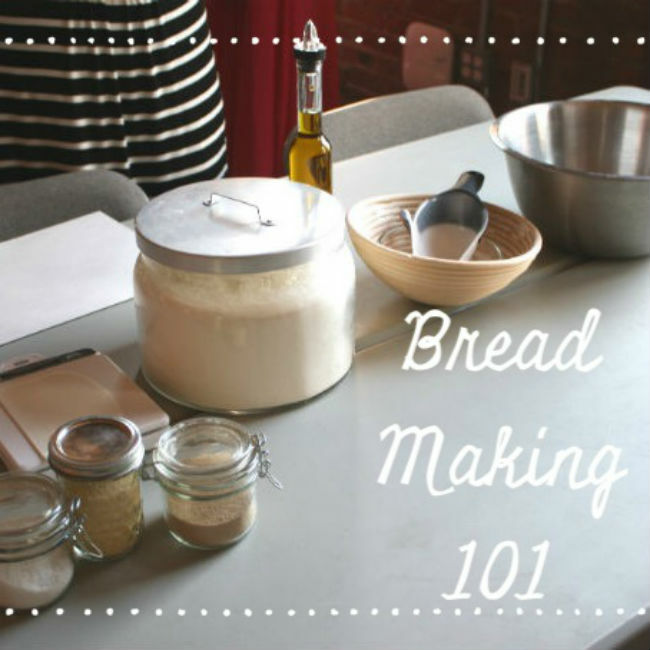 I've always been a little terrified of making bread, simply because of the whole "feeding the yeast" process. Yeast, or fermented dough, is something that only lasts for 7-10 days in the fridge and must be fed if you want to keep it longer than that. I can't even take care of the plant on my patio, let alone dough in the fridge. 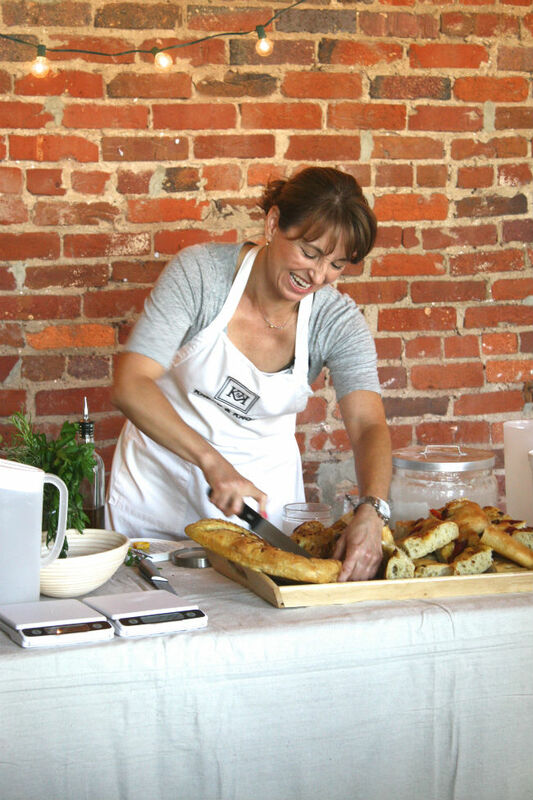 However, Melinda Friend from Knead and Knowmade me change my thinking when it comes to being a bread maker. Whether it's simply learning about all the "additives" in grocery store bread or the fact that she made it easy for me to understand, I've decided to give it another go. Over the Weekend I attempted to use the fermented dough we were given at the workshop to make my own focaccia bread. While I was intimidated at first, the end result made me fired up to keep "feeding the dough" and try my hand at being a bread maker. The taste of the finished product alone has me hooked. While I do have some practice to do, as far as timing and "feeding," I am one step closer to no longer being scared of the dough. It really is easy, and I believe anyone is capable of doing it! 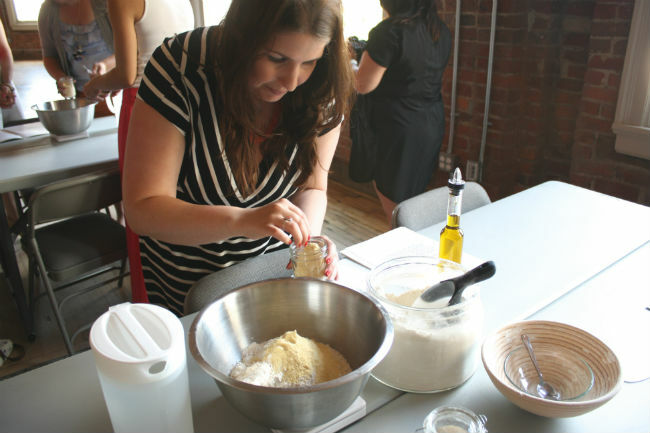 Scroll down to learn how to make Melinda's olive oil focaccia bread. If you have a gram scale, you can zero out the weight each time. This will allow you to pour ingredient after ingredient using one mixing bowl. Place bowl on scale. Add ingredients, weighing each one. 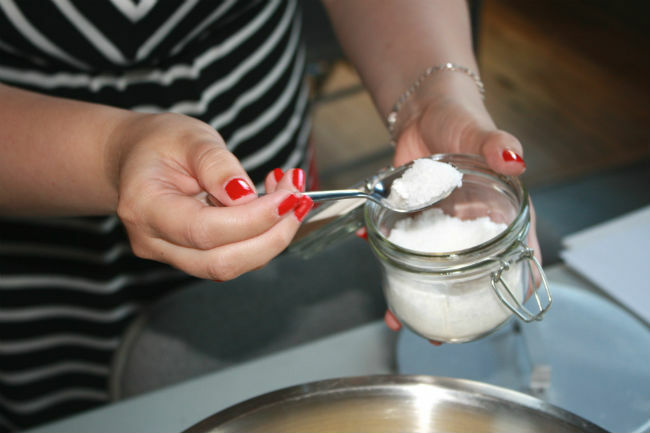 Mix by hand with a plastic bread mixing tool or in a stand mixer. 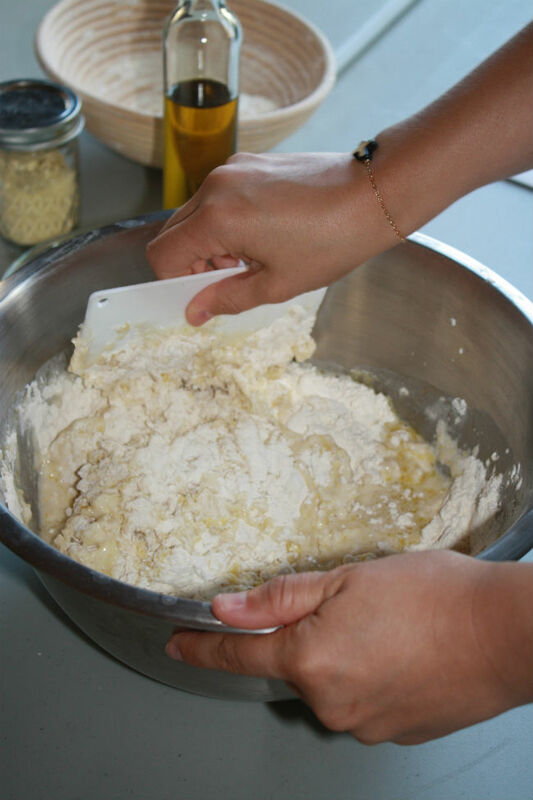 Knead (pull the dough up by the top corners, slap dough down on a flat, hard surface, and fold over) continuously for 3 - 5 minutes. Place dough in a large container and cover. Allow to rest 1 hour at room temperature or up to 12 hours in the fridge. After making my bread this past weekend, I highly recommend letting it rest overnight in the fridge. The longer the time it has to rest, the thicker your bread will be. After your bread has sat for the desired amount of time, turn dough out onto lightly floured surface and give each side a "fold" in toward the center. Turn right side up and cover with a cloth and allow to rest for about 10 minutes. The bread is ready to stretch. If you're going to make focaccia bread with your dough, you'll need a few additional items. Sea salt, poached garlic, roasted red peppers... really any sort of topping you wish to put on your bread. Oil a rimmed baking sheet. Gently stretch the dough toward the edges, being careful not to tear the dough and keeping the same thickness throughout. You may have to let the dough "rest," before attempting to stretch it again. Stretch and then wait a few minutes and come back to it. Stretching the bread is all about the waiting game. It takes time to make good bread. Once it's stretched, allow dough to rise in a warm place for 20 - 30 minutes (**Confession: I forgot to let my bread rise this past weekend when I made it, resulting in very thin bread). Dimple top of dough with fingertips. Drizzle a little bit of olive oil or poached garlic oil over entire surface. Add any combinations of toppings you like. Bake in a preheated 450 degree oven for 20 minutes or until crust is a deep golden brown. Remove and allow to cool for 5 minutes. Cut the bread and enjoy. One batch of focaccia bread makes a TON. Share with friends or your coworkers... this bread will surely make a wonderful impression on them!! Also be sure to checkout Melinda's website and if you're in the area, you can schedule a personalized class with her!! Fermented dough can last about 7 - 10 days in your fridge. 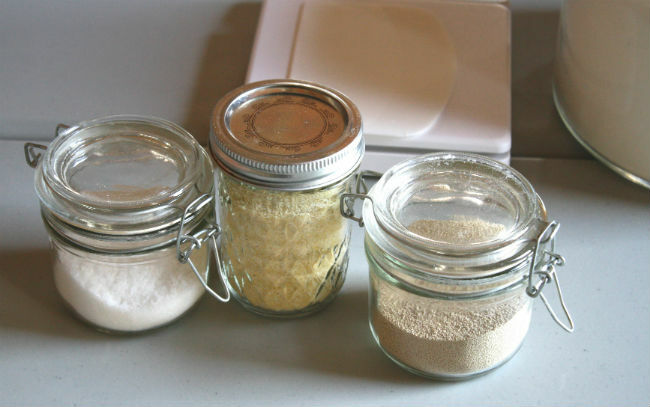 You can feed it in order to last longer, by taking out of the fridge and adding an equal amount of water to its weight and double the amount of white bread flour to what it weighs. 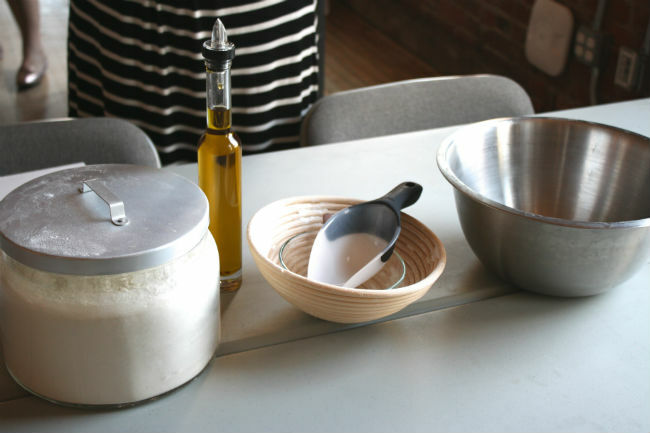 Simply knead the dough and put back in a container, and store in the fridge. Bread will taste better if you use some portion of fermented dough. However, it's not required. You can make poached garlic olive oil by taking a head of garlic, simmering it in olive oil on your stove top for 45 minutes. Mash up the garlic and stir. Store in your fridge and use when you want to. Disclaimer.. poaching garlic can smell up your kitchen. If you live in a small apartment, this may not be the best idea. If your dough starts to bubble, that's GOOD! Just means the dough is feeding on itself, which is supposed to happen. If you have any questions, let me know! I'll do my best to answer them or consult the real expert, Melinda from Knead and Know. sounds so good, i love good foccacia bread!